You could rattle the stars,” she whispered. “You could do anything, if only you dared. And deep down, you know it, too. That’s what scares you most. The first time I read Throne of Glass was two years ago. I had an electronic copy on loan from my local library, and I devoured it in a matter of days while on the road trip heading off to my first year of college. The second time I read Throne of Glass was completed a mere moment ago, and I have to say, I have fallen in love even more the second time around. Throne of Glass is the kind of book that creeps up on you. It pulls you in, and then incapacitates you in swift, subtle movements -sort of like the heroine, and my favorite assassin, Celaena Sardothien. As you well know by now, when I have no idea what to say, I tend to do something very, very specific. Feast your eyes my friends! Throne of Glass has left me speechless, as it usually is with Maas’ writing. The characters are phenomenal, the setting vivid, and the plot so action packed and complex it’ll leave your head spinning. It is perfection, plain and simple. While, of course, there are some things I liked less than others – as a whole, Throne of Glass is a spectacular adventure deserving of all you can offer. It will leave you trying to desperately catch your breath while Celaena dances circles around you and her competitors. 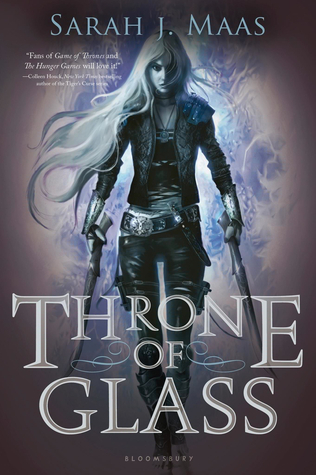 Throne of Glass casts an enchanting, unbreakable, and unforgettable spell. I love all of your GIFS! Celaena will set the world on fire!